Our product range includes a wide range of Slope Stability Detection System, Online Tailing Pond Safety Monitoring System and Personnel Management System for Mines Personnel. Slope disasters are caused by many complex reasons, which can be classified as natural and human causes, as well as destructive force increase and decrease. Therefore we have to avoid slope disasters when we develop slopes. Because of automation and the scale, construction machines create large changes to slope landforms in short times which greatly exceeds the rate of slope self-healing, therefore misgoverned mine development is an easy way to cause slope disasters. This system monitors slope change, disposes real-time monitoring data, and uses it as the basis to judge and manage slope safety. 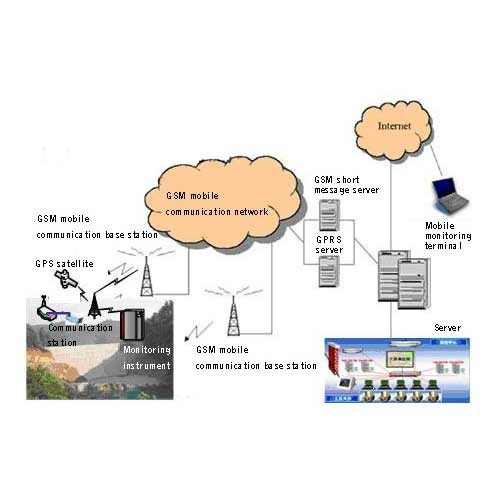 The detection system for slope stability is composed of three subsystems: slope safety monitoring data collection, data communication, and monitoring center data analysis. The system improves mine production safety and digital mine establishment. The detection system for slope stability analyzes the rules of slope form and structure motion, provides analysis information on slope stability, holds landslide configuration, dimension and development, and predicts landslides, so that relevant treatment measures can be adopted to ensure both mine and environmental safety. It adopts multiple modern high-tech capabilities to rebuild traditional artificial safety monitoring, while also collecting relative dynamic information on tailing pond safety via a real time monitor tailing pond operation, which thereby forms a new modern safety monitoring system with informationization and automation and an all directional automatic decision-making platform for safety management and control. The Underground Mine Positioning System for Personnel and Equipment adopts novel international RFID technology. It transmits dynamic personnel and equipment status updates in each portion of the underground mine to a ground computer system, ensuring that the manager can hold the right amount and distribution of underground personnel and moving equipment in a timely fashion. The system can track the underground working state of the leader, the underground check-in and check-out time and movement route of each miner, and ensure more reasonable enterprise dispatching and management. According to data and images provided by the system, it can provide and store personnel and equipment information on the accident location rapidly when accidents happen, as well as adopt relevant rescue measures to improve rescue efficiency.